I’ve written before about Prairie-Style Gardens: Capturing the Essence of the American Prairie Wherever You Live, Lynn Steiner’s 2010 book on garden design done in the spirit of the North American prairie. Lynn has written about native plants extensively, and this book does include a large section of plant profiles. But it’s the book’s focus on design that makes it different and very useful. Lynn starts the book by explaining where prairies existed in North America, a vast swath from the middle of Texas to Alberta, from the western edge of Indiana to Montana. 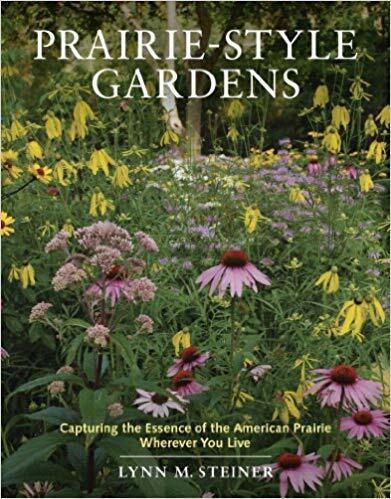 The book is aimed at both gardeners who want to re-create (or at least attempt to re-create) the prairie in their landscape and those who want a traditional home landscape but would like to use prairie plants because of their hardiness and beauty. One aspect of Lynn’s book that I think will make it extremely popular among home gardeners is her understanding that while many people might like to plant a prairie in theory, actually accomplishing it is difficult unless you live in the country. In an earlier article in Northern Gardener, she recommended using formal lines, having clean edges, and maintaining your garden tidily to keep the peace among the neighbors, if you landscape with a prairie aesthetic. But any northern gardener can plant native or prairie plants somewhere on their property — even if it’s a small city lot. The book provides tips on designing a prairie-style garden as well as ideas for choosing plants for particular purposes, such as attracting birds or butterflies. Her plant lists – such as lists for creating season long interest or lists of potentially invasive plants – are worth checking out before a trip to the nursery. For those interested in seeing how fabulous a prairie-style garden can be, I cannot help but put in a plug for the January/February 2012 issue of Northern Gardener, which will be on news stands in a couple of weeks. The cover story is a profile of Lynn’s garden. It’s a beautiful example of blending the prairie and traditional garden style to create a garden that fits perfectly in its environment.